The environmental impact of maritime transport during the last years was decreased to minimum, but shipping accidents continue to be among the biggest pollution and damaging sources. Following the grounding of LNG carrier Sevilla Knutsen at reef or atoll in North Pacific, we were contacted by the Chief of Eauripik Atoll, John Haglelgam, providing his opinion on the accident and its impact, which we publish almost unedited. That reef or atoll referred in publication is called Eauripik Atoll in Yap State of the Federated States of Micronesia. Its residents depend on subsistence living, fishing and farming, but their livelihood depend heavily on the resources of the reef, such as fish, shellfish and other resources. The Sevilla Knutsen plowed into the section of the outer reef called locally Bub Me Iyefangi. That area is on the northern side of the western tip of Eauripik reef, about a mile away from the tip. 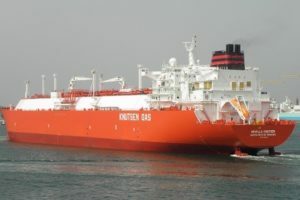 The LNG carrier left behind three large pieces of its hull on the outer reef and a large area of the reef painted in red paint from the bottom paint of the ship. The painted area of the reef is a major concerned because it can cause ciguatera, poisoning of the fish, shellfish, and other resources, of the damaged reef area. This is a major fishing area for the local population. “In your article, you reported that Eauripik was not on Sevilla Knudsen’s navigational chart. We are talking about sophisticated 21st century navigational technology. It is also Sevilla Knutsen’s captain responsibility to make sure his ship get the most updated navigational chart. I don’t know what time of the night or day that the Sevilla Knutsen crashed into the reef, but I think if the man of the watch on the bridge look to the northeast direction he would be able to see an island about four or five miles away”, wrote us John Haglelgam. “Thank you very much for your article. It solved the mystery of the three large pieces of metals on our outer reef and we now know the cause for the red paint on that area of the reef. More importantly, we now know who caused the damage to our reef”, added he. Eauripik Island is a coral atoll of three islands in the western Caroline Islands in the Pacific Ocean in Yap State in the Federated States of Micronesia. Its total land area is only 23.6 hectares 0.236 sq km (0.091 sq mi), but it encloses a deep lagoon of 5.921 sq km (2.286 sq mi). Eauripik Atoll has a population of 148 people, who depend on subsistence living, fishing and farming. Maritime Herald published this opinion almost unedited and thanks for the comments of Mr John Haglelgam.